From left to right: Molly McClure, Regan Felder, Annalee Willson, Olivia Quin, Addison Armstrong and (trainer) Patti Shoemaker. Not pictured: Lauren Sutton, Ana Kelly Hontzas, Lily Rhoden, Sophie Rhoden, Alden McNamara, Anna Claire Sheffield, and Sarah Clay. 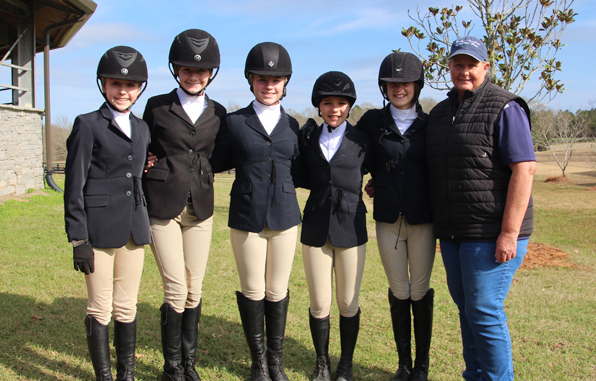 The Jackson Academy Equestrian Team has completed its regular season wrapping up the group’s second year in equestrian competition, with one rider advancing to regionals. In their final regular season horse show at Providence Hill Farm weekend before last, the Middle School team won reserve champion, and Sophie Rhoden got the sportsmanship award. Molly McClure qualified for regionals to be held February 18 at Providence Hill Farm. The JA team sponsored our school’s first horse show in Canton earlier in the school year and had great participation by teams from five states. They plan to sponsor another show in the fall. At the Canton show, Middle School won reserve champion.